I knew my readership would drop off after I fell back from daily posting. Apparently it was worse than I imagined and nobody read my little blog here over the weekend. That’s fair enough; I had to tend other things myself. Still, for the purpose of maximizing the number of page views around here, taking two whole days off in a row was a mistake. There’s some more discussed in this Reading The Comics installment. 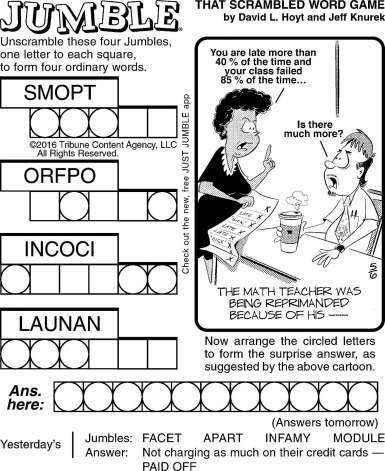 Word problems are dull. At least at the primary-school level. There’s all these questions about trains going in different directions or ropes sweeping out areas or water filling troughs. So Aaron McGruder’s Boondocks rerun from the 5th of May (originally run the 22nd of February, 2001) is a cute change. It’s at least the start of a legitimate word problem, based on the ways the recording industry took advantage of artists in the dismal days of fifteen years ago. I’m sure that’s all been fixed by now. Fill in some numbers and the question might interest people. Glenn McCoy and Gary McCoy’s The Duplex for the 5th of May is a misunderstanding-fractions joke. I’m amused by the idea of messing up quarter-pound burgers. But it also brings to mind a summer when I worked for the Great Adventure amusement park and got assigned one day as cashier at the Great American Hamburger Stand. Thing is, I didn’t know anything about the stand besides the data point that they probably sold hamburgers. So customers would order stuff I didn’t know, and I couldn’t find how to enter it on the register, and all told it was a horrible mess. If you were stuck in that impossibly slow-moving line, I am sorry, but it was management’s fault; I told them I didn’t know what I was even selling. Also I didn’t know the drink cup sizes so I just charged you for whatever you said and if I gave you the wrong size I hope it was more soda than you needed. On a less personal note, I have heard the claim about why one-third-pound burgers failed in United States fast-food places. Several chains tried them out in the past decade and they didn’t last, allegedly because too many customers thought a third of a pound was less than a quarter pound and weren’t going to pay more for less beef. It’s … plausible enough, I suppose, because people have never been good with fractions. But I suspect the problem is more linguistic. A quarter-pounder has a nice rhythm to it. A half-pound burger is a nice strong order to say. A third-pound burger? The words don’t even sound right. You have to say “third-of-a-pound burger” to make it seem like English, and it’s a terribly weak phrase. The fast food places should’ve put their money into naming it something that suggested big-ness but not too-big-to-eat. Mark Tatulli’s Heart of the City for the 5th is about Heart’s dread of mathematics. Her expressed fear, that making one little mistake means the entire answer is wrong, is true enough. But how how much is that “enough”? If you add together someting that should be (say) 18, and you make it out to be 20 instead, that is an error. But that’s a different sort of error from adding them together and getting 56 instead. And errors propagate. At least they do in real problems, in which you are calculating something because you want to use it for something else. An arithmetic error on one step might grow, possibly quite large, with further steps. That’s trouble. This is known as an “unstable” numerical calculation, in much the way a tin of picric acid dropped from a great height onto a fire is an “unstable” chemical. The error might stay about as large as it started out being, though. And that’s less troublesome. A mistake might stay predictable. The calculation is “stable” In a few blessed cases an error might be minimized by further calculations. You have to arrange the calculations cleverly to make that possible, though. That’s an extremely stable calculation. And this is important because we always make errors. At least in any real calculation we do. When we want to turn, say, a formula like πr2 into a number we have to make a mistake. π is not 3.14, nor is it 3.141592, nor is it 3.14159265358979311599796346854418516. Does the error we make by turning π into some numerical approximation matter? It depends what we’re calculating, and how. There’s no escaping error and it might be a comfort to Heart, or any student, to know that much of mathematics is about understanding and managing error. Joe Martin’s Boffo for the 6th of May, 2016. The link’s already expired, I bet. Yes, the panel did appear on a Sunday. Joe Martin’s Boffo for the 6th of May is in its way about the wonder of very large numbers. On some reasonable assumptions — that our experience is typical, that nothing is causing traits to be concentrated one way or another — we can realize that we probably will not see any extreme condition. In this case, it’s about the most handsome men in the universe probably not even being in our galaxy. If the universe is large enough and people common enough in it, that’s probably right. But we likely haven’t got the least handsome either. Lacking reason to suppose otherwise we can guess that we’re in the vast middle. David L Hoyt and Jeff Knurek’s Jumble for the 6th of May mentions mathematicians and that’s enough, isn’t it? Without spoiling the puzzle for anyone, I will say that “inocci” certainly ought to be a word meaning something. So get on that, word-makers. David L Hoyt and Jeff Knurek’s Jumble for the 6th of May, 2016. While ‘ORFPO’ mey not be anything, I believe there should be some company named ‘OrfPro’ that offers some kind of service. Dave Blazek’s Loose Parts for the 6th brings some good Venn Diagram humor back to my pages. Good. It’s been too long. I admit I did this recently, and am doing it again. But I don’t mean to make it a habit. I ran across a few comic strips that I can’t, even with a stretch, call mathematically-themed, but I liked them too much to ignore them either. So they’re at the end of this post. I really don’t intend to make this a regular thing in Reading the Comics posts. Justin Boyd’s engagingly silly Invisible Bread (June 22) names the tuning “two steps below A”. He dubs this “negative C#”. This is probably an even funnier joke if you know music theory. The repetition of the notes in a musical scale could be used as an example of cyclic or modular arithmetic. Really, that the note above G is A of the next higher octave, and the note below A is G of the next lower octave, probably explains the idea already. If we felt like, we could match the notes of a scale to the counting numbers. Match A to 0, B to 1, C to 2 and so on. Work out sharps and flats as you like. Then we could think of transposing a note from one key to another as adding or subtracting numbers. (Warning: do not try to pass your music theory class using this information! Transposition of keys is a much more subtle process than I am describing.) If the number gets above some maximum, it wraps back around to 0; if the number would go below zero, it wraps back around to that maximum. Relabeling the things in a group might make them easier or harder to understand. But it doesn’t change the way the things relate to one another. And that’s why we might call something F or negative C#, as we like and as we hope to be understood. Hilary Price’s Rhymes With Orange for the 23rd of June, 2015. Hilary Price’s Rhymes With Orange (June 23) reminds us how important it is to pick the correct piece of chalk. The mathematical symbols on the board don’t mean anything. A couple of the odder bits of notation might be meant as shorthand. Often in the rush of working out a problem some of the details will get written as borderline nonsense. The mathematician is probably more interested in getting the insight down. She’ll leave the details for later reflection. Jason Poland’s Robbie and Bobby (June 23) uses “calculating obscure digits of pi” as computer fun. Calculating digits of pi is hard, at least in decimals, which is all anyone cares about. If you wish to know the 5,673,299,925th decimal digit of pi, you need to work out all 5,673,299,924 digits that go before it. There are formulas to work out a binary (or hexadecimal) digit of pi without working out all the digits that go before. This saves quite some time if you need to explore the nether-realms of pi’s digits. The comic strip also uses Stephen Hawking as the icon for most-incredibly-smart-person. It’s the role that Albert Einstein used to have, and still shares. I am curious whether Hawking is going to permanently displace Einstein as the go-to reference for incredible brilliance. His pop culture celebrity might be a transient thing. I suspect it’s going to last, though. Hawking’s life has a tortured-genius edge to it that gives it Romantic appeal, likely to stay popular. Paul Trap’s Thatababy (June 23) presents confusing brand-new letters and numbers. Letters are obviously human inventions though. They’ve been added to and removed from alphabets for thousands of years. It’s only a few centuries since “i” and “j” became (in English) understood as separate letters. They had been seen as different ways of writing the same letter, or the vowel and consonant forms of the same letter. If enough people found a proposed letter useful it would work its way into the alphabet. Occasionally the ampersand & has come near being a letter. (The ampersand has a fascinating history. Honestly.) And conversely, if we collectively found cause to toss one aside we could remove it from the alphabet. English hasn’t lost any letters since yogh (the Old English letter that looks like a 3 written half a line off) was dropped in favor of “gh”, about five centuries ago, but there’s no reason that it couldn’t shed another. Numbers are less obviously human inventions. But the numbers we use are, or at least work like they are. Arabic numerals are barely eight centuries old in Western European use. Their introduction was controversial. People feared shopkeepers and moneylenders could easily cheat people unfamiliar with these crazy new symbols. Decimals, instead of fractions, were similarly suspect. Negative numbers took centuries to understand and to accept as numbers. Irrational numbers too. Imaginary numbers also. Indeed, look at the connotations of those names: negative numbers. Irrational numbers. Imaginary numbers. We can add complex numbers to that roster. Each name at least sounds suspicious of the innovation. There are more kinds of numbers. In the 19th century William Rowan Hamilton developed quaternions. These are 4-tuples of numbers that work kind of like complex numbers. They’re strange creatures, admittedly, not very popular these days. Their greatest strength is in representing rotations in three-dimensional space well. There are also octonions, 8-tuples of numbers. They’re more exotic than quaternions and have fewer good uses. We might find more, in time. Rina Piccolo’s entry in Six Chix for the 24th of June, 2015. Rina Piccolo’s entry in Six Chix this week (June 24) draws a house with extra dimensions. An extra dimension is a great way to add volume, or hypervolume, to a place. A cube that’s 20 feet on a side has a volume of 203 or 8,000 cubic feet, after all. A four-dimensional hypercube 20 feet on each side has a hypervolume of 160,000 hybercubic feet. This seems like it should be enough for people who don’t collect books. Morrie Turner’s Wee Pals (June 24, rerun) is just a bit of wordplay. It’s built on the idea kids might not understand the difference between the words “ratio” and “racial”. Tom Toles’s Randolph Itch, 2 am (June 25, rerun) inspires me to wonder if anybody’s ever sold novelty 4-D glasses. Probably they have, sometime. Phil Dunlap’s Ink Pen (June 23, rerun) is aimed at the folks still lingering in grad school. Please be advised that most doctoral theses do not, in fact, end in supervillainy. Darby Conley’s Get Fuzzy (June 25, rerun) tickles me. But Albert Einstein did after all say many things in his life, and not everything was as punchy as that line about God and dice. The @mathematicsprof tweet above links to a paper, by Carolyn Gordon and David Webb and published in American Scientist in 1996, that’s about one of those questions that’s both mathematically interesting and of obvious everyday interest. The question was originally put, in nice compact and real-world-relevant form, in 1966 by Mark Kac: can one hear the shape of a drum? At first glance the answer may seem, “of course” — you can hear the difference between musical instruments by listening to them. You might need experience, but, after all, you’re not going to confuse a bass drum from a bongo even if you haven’t been in the music store much. At second glance, why would Kac bother asking the question if the answer were obvious? He didn’t need the attention. He had, among other things, his work in ferromagnetism to be proud of (and I should write about that some.) And could you tell one bass drum from another? The question ties into what’s known as “spectral theory”: given a complicated bundle of information what can you say about the source? One metaphorical inspiration here is studying the spectrum of a burning compound: the wavelengths of light emitted by it give you information about what elements go into the compound, and what their relative abundances are. The sound of a drum is going to be a potentially complicated set of sound waves produced by the drum’s membrane itself oscillating. That membrane oscillation is going to depend, among other things, on the shape of the membrane, and that’s why we might suppose that we could tell what the shape of the drum is by the sound it makes when struck. But then it might also be that multiple different shapes could produce the exact same sound. It took to about 1990 to get a definite answer; Gordon and Webb, along with Scott Wolpert, showed that you can get different-shaped drums that sound the same, and very nicely showed an example. In the linked article, Gordon and Webb describe some of the history of the problem and how they worked out a solution. It does require some technical terms that maybe even re-reading several times won’t help you parse, but if you’re willing to just move on past a paragraph that looks like jargon to the rest I believe you’ll find some interesting stuff out, for example, whether you could at least hear the area of a drum, even if you can’t tell what the shape is. Well, I did say we were getting to the end of summer. It’s taken only a couple days to get a fresh batch of enough mathematics-themed comics to include here, although the majority of them are about mathematics in ways that we’ve seen before, sometimes many times. I suppose that’s fair; it’s hard to keep thinking of wholly original mathematics jokes, after all. When you’ve had one killer gag about “537”, it’s tough to move on to “539” and have it still feel fresh. Tom Toles’s Randolph Itch, 2 am (August 27, rerun)	presents Randolph suffering the nightmare of contracting a case of entropy. Entropy might be the 19th-century mathematical concept that’s most achieved popular recognition: everyone knows it as some kind of measure of how disorganized things are, and that it’s going to ever increase, and if pressed there’s maybe something about milk being stirred into coffee that’s linked with it. The mathematical definition of entropy is tied to the probability one will find whatever one is looking at in a given state. Work out the probability of finding a system in a particular state — having particles in these positions, with these speeds, maybe these bits of magnetism, whatever — and multiply that by the logarithm of that probability. Work out that product for all the possible ways the system could possibly be configured, however likely or however improbable, just so long as they’re not impossible states. Then add together all those products over all possible states. (This is when you become grateful for learning calculus, since that makes it imaginable to do all these multiplications and additions.) That’s the entropy of the system. And it applies to things with stunning universality: it can be meaningfully measured for the stirring of milk into coffee, to heat flowing through an engine, to a body falling apart, to messages sent over the Internet, all the way to the outcomes of sports brackets. It isn’t just body parts falling off. Randy Glasbergen’s _The Better Half_ For the 28th of August, 2014. Eric the Circle (August 28, by “Gilly” this time)	sneaks into my pages again by bringing a famous mathematical symbol into things. I’d like to make a mention of the links between mathematics and music which go back at minimum as far as the Ancient Greeks and the observation that a lyre string twice as long produced the same note one octave lower, but lyres and strings don’t fit the reference Gilly was going for here. Too bad. Zach Weinersmith’s Saturday Morning Breakfast Cereal (August 28)	is another strip to use a “blackboard full of mathematical symbols” as visual shorthand for “is incredibly smart stuff going on”. The symbols look to me like they at least started out as being meaningful — they’re the kinds of symbols I expect in describing the curvature of space, and which you can find by opening up a book about general relativity — though I’m not sure they actually stay sensible. (It’s not the kind of mathematics I’ve really studied.) However, work in progress tends to be sloppy, the rough sketch of an idea which can hopefully be made sound. Anthony Blades’s Bewley (August 29)	has the characters stare into space pondering the notion that in the vastness of infinity there could be another of them out there. This is basically the same existentially troublesome question of the recurrence of the universe in enough time, something not actually prohibited by the second law of thermodynamics and the way entropy tends to increase with the passing of time, but we have already talked about that. For today’s entry in the popular “I suppose everybody heard about this already like five years ago but I just found out about it now”, there’s the Online Encyclopedia of Integer Sequences, which is a half-century-old database (!) of various commonly appearing sequences of integers. It started, apparently, when Neil J A Sloane (a graduate student at Cornell University) needed to know the next terms in a sequence describing a particular property of trees, and he couldn’t find a way to look it up and so we got what I imagine to be that wonderful blend of frustration (“it should be easy to find this”) and procrastination (“surely having this settled once and for all will speed my dissertation”) that produces great things. It’s even got a search engine, so that if you have the start of a sequence — say, “1, 4, 5, 16, 17, 20, 21” — it can find whether there’s any noteworthy sequences which begin that way and even give you a formula for finding successive terms, programming code for the terms, places in the literature where it might have appeared, and other neat little bits. This isn’t foolproof, of course. Deductive logic will tell you that just because you know the first (say) ten terms in a sequence you don’t actually know what the eleventh will be. There are literally infinitely many possible successors. However, we’re not looking for deductive inevitability with this sort of search engine. We’re supposing that our sequence starts off describing some pattern that can be described by some rule that looks simple and attractive to human eyes. (So maybe my example doesn’t quite qualify, though their name for it makes it sound pretty nice.) There’s bits of whimsy (see the first link I posted), and chances to discover stuff I never heard of before (eg, the Wilson Primes: the encyclopedia says it’s believed there are infinitely many of them, but only three are known — 5, 13, and 563, with the next term unknown but certainly larger than 20,000,000,000,000), and plenty of stuff about poker and calendars. On the title: some may protest, correctly, that a sequence and a series are very different things. They are correct: mathematically, a sequence is just a string of numbers, while a series is the sum of the terms in a sequence, and so is a single number. It doesn’t matter. Titles obey a logic of their own. My Beloved is reading J G Ballard’s Vermillion Sands ; early in one of the book’s stories is a character wondering if an odd sound comes from one of the musical … let’s call it instruments, one with a 24-octave range. We both thought, wow, that’s a lot of range. Is it a range any instrument could have? As we weren’t near our computers this turned into a mental arithmetic problem. It’s solvable in principle because, if you know the frequency of one note, then you know the frequency of its counterpart one octave higher (it’s double that), and one octave lower (it’s half that). It’s not solvable, at this point, because we don’t have any information about what the range is supposed to be. So here’s roughly how we worked it out. The note A above middle C is 440 Hertz, or at least you can use that for tuning ever since the International Standards Organization set that as a tuning standard in 1953. (As with any basically arbitrary standard this particular choice is debatable, although, goodness but this page advocating a 432 Hertz standard for A doesn’t do itself any favors by noting that “440 Hz is the unnatural standard tuning frequency, removed from the symmetry of sacred vibrations and overtones that has declared war on the subconscious mind of Western Man” and, yes, Nikola Tesla and Joseph Goebbels turn up in the article because you might otherwise imagine taking it seriously.) Anyway, it doesn’t matter; 440 is just convenient as it’s a number definitely in hearing range. So I’m adding the assumption that 440 Hz is probably in the instrument’s range. And I’ll work on the assumption that it’s right in the middle of the range, that is, that we should be able to go down twelve octaves and up twelve octaves, and see if that assumption leads me to any problems. And now I’ve got the problem defined well enough to answer: is 440 divided by two to the twelfth power in human hearing range? Is 440 times two to the twelfth power in range? I’m not dividing 440 by two a dozen times; I might manage that with pencil and paper but not in my head. But I also don’t need to. Two raised to the tenth power is pretty close to 1,000, as anyone who’s noticed that the common logarithm of two is 0.3 could work out. Remembering a couple approximations like that are key to doing any kind of real mental arithmetic; it’s all about turning the problem you’re interested in into one you can do without writing it down. Another key to this sort of mental arithmetic is noticing that two to the 12th power is equal to two to the second power (that is, four) times two to the tenth power (approximately 1,000). In algebra class this was fed to you as something like “ax + y = (ax)(a y)”, and it’s the trick that makes logarithms a concept that works. Getting back to the question, 440 divided by two twelve times over is going to be about 440 divided by 4,000, which is going to be close enough to one-tenth Hertz. There’s no point working it out to any more exact answer, since this is definitely below the range of human hearing; I think the lower bound is usually around ten to thirty Hertz. Well, no matter; maybe the range of the instrument starts higher up and keeps on going. To see if there’s any room, what’s the frequency of a note twelve octaves above the 440-Hertz A? That’s going to be 440 Hertz times 4,000, which to make it simpler I’ll say is something more than 400 times 4000. The four times four is easy, and there’s five zeroes in there, so, that suggests an upper range on the high side of 1,600,000 Hertz. Again, I’m not positive the upper limit of human hearing but I’m confident it’s not more than about 30,000 Hertz, and I leave space below for people who know what it is exactly to say. There’s just no fitting 24 octaves into the human hearing range. So! Was Ballard just putting stuff into his science fiction story without checking whether the numbers make that plausible, if you can imagine a science fiction author doing such a thing? It’s conceivable. It’s also possible Ballard was trying to establish the character was a pretentious audiophile snob who imagines himself capable of hearing things that no, in fact, can’t be discerned. However, based on the setting … the instruments producing music in this story (and other stories in the book), set in the far future, include singing plants and musical arachnids and other things that indicate not just technology but biology has changed rather considerably. If it’s possible to engineer a lobster that can sing over a 24 octave range, it’s presumably possible to engineer a person who can listen to it. So. The really big flaw in my analysis of an “Infinite Jukebox” tune — one in which the song is free to jump between two points, with a probability of of jumping from the one-minute mark to the two-minute mark, and an equal likelihood of jumping from the two-minute mark to the one-minute mark — and my conclusion that, on average, the song would lose a minute just as often as it gained one and so we could expect the song to be just as long as the original, is that I made allowance for only the one jump. The three-minute song with two points at which it could jump, which I used for the model, can play straight through with no cuts or jumps (three minutes long), or it can play jumping from the one-minute to the two-minute mark (a two minute version), or it can play from the start to the second minute, jump back to the first, and continue to the end (a four minute version). But if you play any song on the Infinite Jukebox you see that more can happen. Working through my circle of friends have been links to The Infinite Jukebox, an amusing web site which takes a song, analyzes points at which clean edits can be made, and then randomly jumps through them so that the song just never ends. The idea is neat, and its visual representation of the song and the places where it can — but doesn’t have to — jump forward or back can be captivating. My Dearly Beloved has been particularly delighted with the results on “I Am A Camera”, by the Buggles, as it has many good edit points and can sound quite natural after the jumps if you aren’t paying close attention to the lyrics. I recommend playing that at least a bit so you get some sense of how it works, although listening to an infinitely long rendition of the Buggles, or any other band, is asking for a lot. One question that comes naturally to mind, at least to my mind, is: given there are these various points where the song can skip ahead or skip back, how long should we expect such an “infinite” rendition of a song to take? What’s the average, that is the expected value, of the song’s playing? I wouldn’t dare jump into analyzing “I Am A Camera”, not without working on some easier problems to figure out how it should be done, but let’s look. This is the Geoff Downes side of the Buggles’s “The Age Of Plastic”. The Trevor Horn side is the one typically taken to be the front and so easier to find. One. OK. We know that. Every person who ever suffered through that innocent-looking problem where you’re given the size of a record and data about how wide the groove is and asked how many are on the side of the record and then after a lot of confused algebra handed in an answer and discovered it was a trick question has that burned into their brain, and maybe still resents the teacher or book of math puzzles that presented them with the challenge only to have the disappointing answer revealed. This may be a generational frustration. I think but don’t know that compact discs and DVDs actually have concentric rings so that the how-many-grooves equivalent would be a meaningful, non-trick question; to check would require I make the slightest effort so I’ll just trust that if I’m wrong someone will complain. In another thirty years the word problem may have disappeared from the inventory. But it irritated me, and my Dearly Beloved, and I’m sure irritated other people too. And, yes, we’ve all heard of those novelty records where there’s two or three grooves on a side and you don’t know until fairly well into the performance which version you’re listening to, but I’ve never actually held one in my hand, and neither have you. For the sake of this discussion we may ignore them. But the question we plunge into answering before we’ve noticed the trick is more like this: If we drew a line from the hole in the center straight out, a radial line if I want to make this sound mathematical, then it crosses some number of grooves; how many? Or maybe like this: how many times does the groove go around the center of the record? And that’s interesting. And I want to describe how I’d work out the problem — in fact, how I did work it out a few nights ago — including a major false start and how that got me to a satisfactory answer. Author Joseph NebusPosted on Tuesday, 18 September, 2012 Wednesday, 4 April, 2018 Categories Math, Mathematics, Maths, Recreational MathematicsTags arithmetic, estimates, math puzzles, music, record player, records, word problems48 Comments on How Many Grooves Are On A Record’s Side? Now, let me try my first guess at saying whether it’s easier to tip the cube over by pushing along the middle of the edge or by pushing at the corner. I laid out the ground rules, and particularly, the symbols used for the size of the box (it’s of length ) and how far the center of mass (the dead center of the box) is from the edges and the corners last time around. Here’s my first thought about what has to be done to tip the box over: we have to make the box pivot on some point — along one edge, if we’re pushing on the edge; along one corner, if we’re pushing on the corner — and so make it start to roll. If we can raise the center of mass above the pivot then we can drop the box back down with some other face to the floor, which has to count as tipping the box over. If we don’t raise the center of mass we aren’t tipping the box at all, we’re just shoving it.